While I am looking forward to being back on the air in June, there is something I want to share with people that cannot wait. I want to tell you about Kai Anderson. 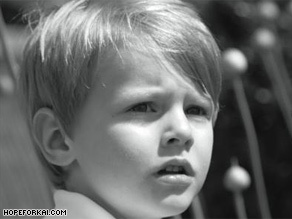 Kai is a 5-year-old boy who lives in my neighborhood in New York City. Kai has a rare form of leukemia. Kai Anderson has a rare form of leukemia. This little boy's best hope lies in a bone marrow transplant. His only hope is a bone marrow transplant and he desperately needs to find a match. As if Kai's family weren't going through enough, his father was diagnosed with a very rare form of lymphoma -- that's two cancers in this one family. Our community in downtown Manhattan has mobilized to try to find a bone marrow match for Kai. We are asking people to consider taking a very quick and test. I have done it. It just involves a q-tip swab in the cheek.